Well, this week has been preoccupied with unpacking from our recent Yellowstone and Casper, WY eclipse trip and trying to catch up with the homework. So, let's just review the upcoming calendar of events and news items and then look at some interesting eclipse ambient temperature data and finish with some astrophysics odds and ends. A check of the meeting calendar shows that the Mars Society meeting at UCI is coming up next week, September 7-10. So, if you haven't signed up yet, now is the time to do it. This conference is pretty low cost ($270) for 4-day international conferences like this one. The conference schedule shows each day beings with a plenary session and then breaks out into four different tracks, each covering some different aspect of Mars, or of getting to Mars, or living on Mars, etc. It should be fun and informative. See you there! We are beginning to see a whole collection of images and reports from other OCA folks that travelled wide and far to see the August eclipse. One posted item, that was of special interest to my desire to do "sciencey" type astronomy proejcts, is the following measurement of the ambient temperature during the eclipse by OCA Dave Kodama. 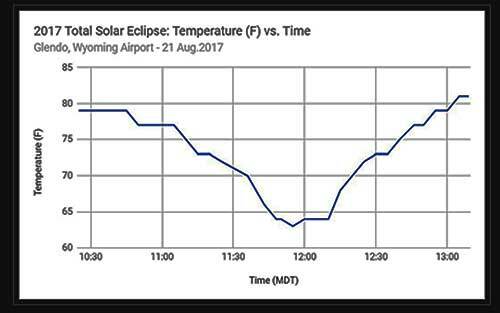 Now, we noticed and felt the change in temperature in Casper as the eclipse moved through totality, and I thought it would have been neat to actually measure and record the temperature change. Well, Dave did exactly that from their viewing spot in Glendo, WY. Check out the temperature plot below. Note that the temperature dropped almost 20 degrees. Thanks for that Dave! By the way, if you are interested in seeing some really great images of the eclipse and other expert astrophotos as well, be sure to check out Dave's website referenced in the image below or on this blog main page. While we were putting away our suitcases from the trip to Casper, we found some mementos of the eclipse that we picked up there. The stamped envelope with the Casper Post Office imprint was being sold by some entrepreneurs at our eclipse viewing site. I don't know what I'm going to do with this item. I'm not adverse to keeping old magazines that I claim to want to read someday, but what to do with this envelope? 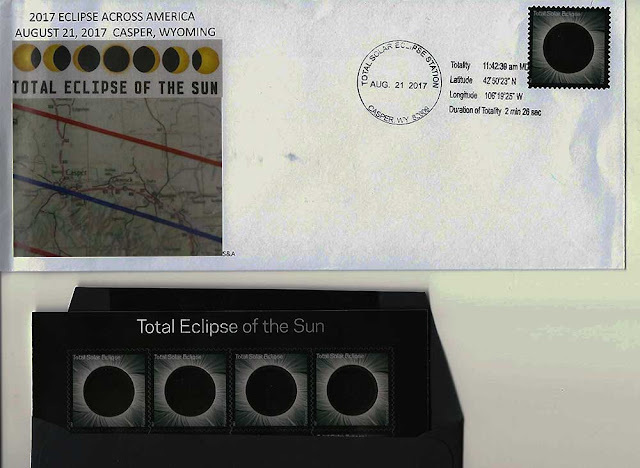 I don't know, but I do know that the little set of 16 eclipse postage stamps that OCA friends, Marty and Bonnie gave us a little token of thanks is a much more useful and thoughtful gift! The stamps are heat sensitive and you can see a different image by heating them up a bit with your thumb. Thanks for that! Also in cleaning up our travel bags I found my Astrocon notes and wanted to share one of the presenters explanation of why disks of material result from the collapse of large clouds of gas and dust. Dr. Stacey Palen, Weber State University, talked about the formation of stars from the collapse of these large clouds of gas. Now we have heard that during the collapse the material often arranges itself in a central star and a disk of material that often will contain planets. She was a very good speaker (I wished I had someone like her for my early physics courses) and talked us through how by considering angular momentum of the collapsing gas cloud that one can get a big picture view of why it can form a disk around the central star. She said to consider the ball of gas with some small net angular momentum, about some arbitrary axis, which is not unusual because having some small angular momentum is easier and more likely than having exactly zero net angular momentum. 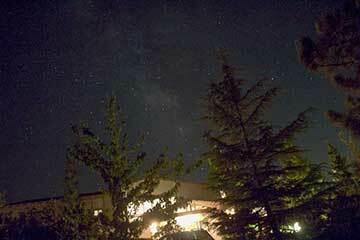 Then consider various particles, some initially moving in various directions. Those that are travelling in the same direction as the net angular momentum might collide, but the net result of that collision is mostly to just stay in that same plane. Particles that were moving, say downward at a slant, could collide with particles coming up from the other direction and the net result would be to mostly cancel out the up/down momentum and to keep momentum in the direction of the original gas cloud net momentum. Similarly for other random directions and collisions after which you can get the sense that, yes, the ball of gas tends to settle down into a central star with a disk. Now, it will take a lot more mathematical work to do it exactly, but her description finally enabled me to get a better feel as to why the disk would form. Thank you for that Professor Palen! Speaking of astrophysics, the free online course is going quite well and we are up to lesson four and this lesson also included how angular momentum and disks interact to generate a lot of energy. 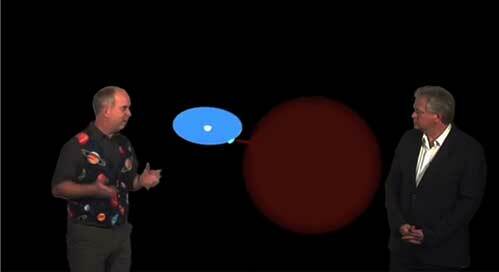 The screenshot below shows the course instructors, Paul Francis and Nobel laureate Brian Schmidt, discuss a binary star system made up of a white dwarf and a red giant. Consider the toy model in the screenshot from "Astrophysics: The Violent Universe". In it we see a binary star system made up of a red giant star, whose outer atmosphere is being drawn into the disk of material surrounding a white dwarf companion. This model has been found to be very useful in predicting and explain the light curves and spectra as seen from astronomical observations. The nature and amount of material that leaves the red giant and falls into the white dwarf is thought to explain how the extreme light pulsations are formed. First there can be a pulsating or flickering light generated as the material collides with the disk. Secondly, as material ends up on the white dwarf, it is possible that due to the high gravitational potential there is sufficient to make the conditions necessary for nuclear fusion. The white dwarf could have about the same mass as our sun, but because it is so much smaller in size, the gravitational potential can create very high pressures at its surface. So even though the white dwarf itself is too old to have any internal fusion of hydrogen, material that lands on the surface can see high enough pressures to ignite and produce the wide range of light curves observed, which include flares that are momentarily millions of times brighter than the star itself. This is all pretty neat and my little description here has left out a lot of interesting details. So, if you are interested, be sure to sign up for the free course and get into it yourselves! Finally, after so enjoying seeing the Milky Way in Casper, our friends at Amazon helped me get a tiny, tiny, little tripod for the DSLR. This little tripod is easy to carry around and easy to pack on the airplane. The plan is to use this little tripod to capture images of the Milky Way and of course the Northern Lights on our upcoming September cruise to Iceland and beyond. 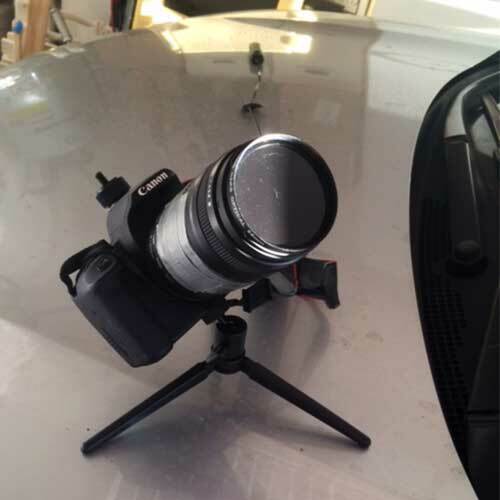 With this little tripod and the new 10-18mm wide angle lens, getting photos of the lights should be great. My outside observing plan for this week includes still trying to capture an airplane transiting the sun and setting up the DSLR with 10-18mm wide angle lens and trying to see what the Milky Way looks like in our city lights view. I'm not too hopeful that much can be seen here of the MW, but stay tuned.